Constructed: at the beginning of the 5th century B.C. On the southwest corner of the Forum, where the road ascends to the Capitoline Hill, the Temple of Saturn up to this day dominates the visual appearance of the Forum with its towering and impressive ancient façade. The temple belongs to the oldest sacral buildings on the Forum; the cult of Saturn having been practised on this spot since the Regal Period. 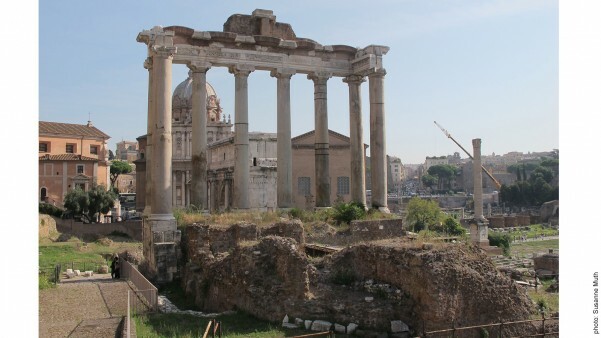 The specific appearance of the temple visible today dates back to restoration measures in Late Antiquity; remains of both previous structures – the early Republican temple from the early 5th century B.C. and the early Augustan temple from the late 1st century B.C. – were incorporated into the structure of the temple from Late Antiquity. 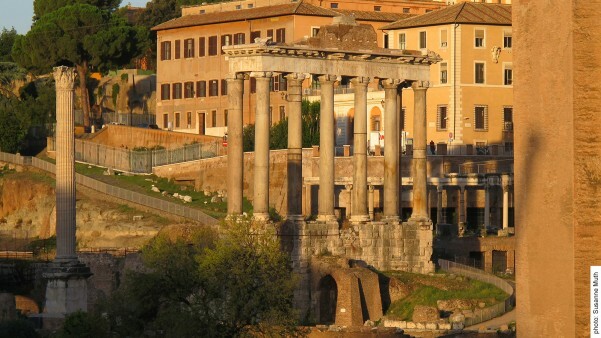 Before the first Temple of Saturn was constructed here in the early Republic, an altar of Saturn apparently already existed on that exact spot, if we are to believe the accounts given by writers from the 1st century B.C. According to legend, it was the mythical hero Heracle, who consecrated the altar. Starting with the initial construction of the temple we enter a much more historically accessible time period: the beginning of the Regal Period. The literary sources report that Tarquinius Superbus, the last king of Rome, gave the order to build the Temple of Saturn. Because he was overthrown, however, he was unable to dedicate the temple when it was completed. The ancient sources, which explicitly contradict each other, name a variety of possible candidates for the dedicator of the completed temple: Titus Larcius, in the year of his dictatorship (501 B.C.) or consulate (498 B.C. ); the consuls in 497 B.C., A. Sempronius Atratinus and M. Minucius Augurinus; or the consul in 501 or 493 B.C., Postimius Cominius. 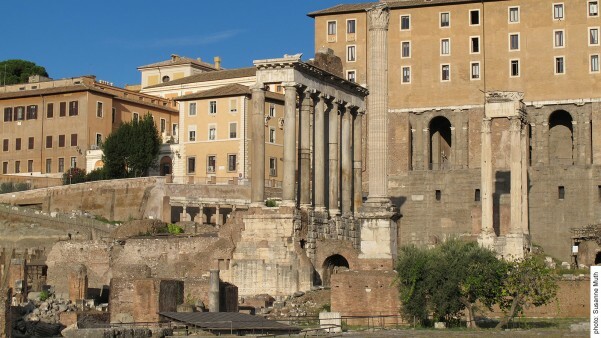 Although there is a high degree of uncertainty surrounding the actual dedicator of the temple, the temple most certainly dates to the beginning of the early Republic – clearly, it must have been a building that the early Republic associated itself with and exploited for ideological reasons. 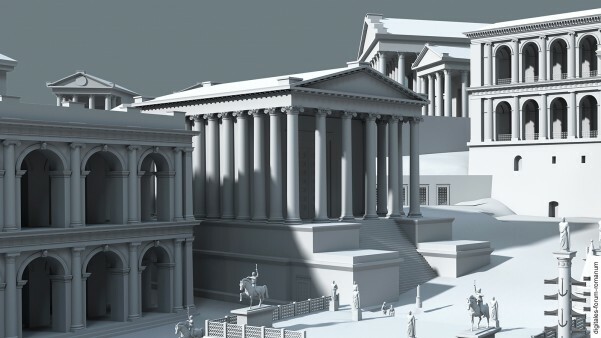 Whether the temple’s structure was altered or restored in the following centuries remains unclear: We have no secure evidence for this; in light of the increasing age of the early Republican temple it can be assumed that smaller alterations were made. 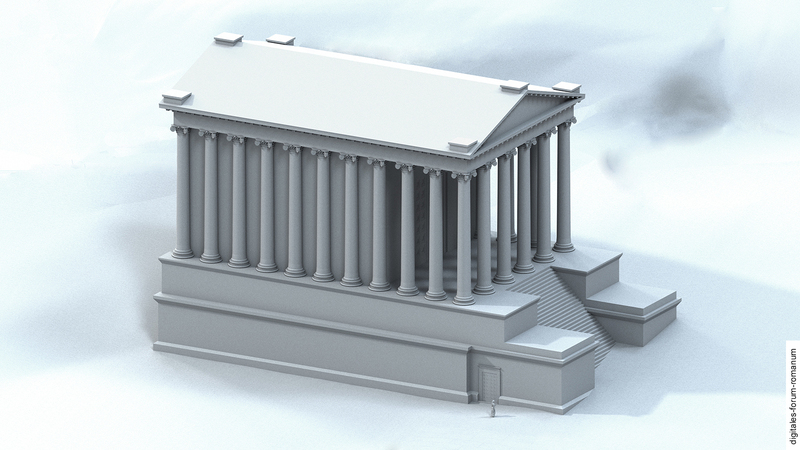 In general, however, the early Republican temple seems to have retained its archaic visual appearance until the 1st century B.C. Only in 42 B.C. was the temple sucked back into the vortex of active construction policies that had a profound impact on the entire Forum at the time. L. Munatius Plancus, triumphator over the Raeti and consul in 42 B.C., was tasked with the rebuilding of the Temple of Saturn, which he financed with the spoils from his military campaign against the Raeti. 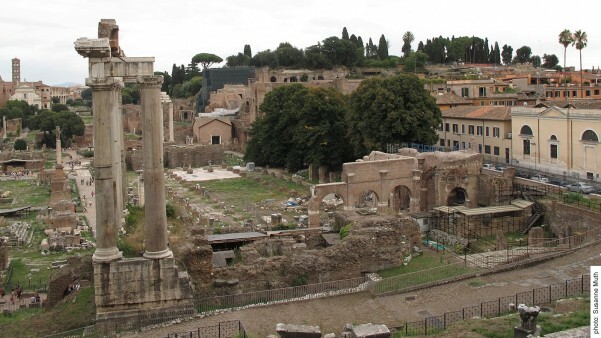 Because the political influence of Munatius Plancus, an open supporter of Marc Antony, was waning in the wake of the strife between Octavian and Marc Antony, the construction work was likely discontinued for a longer period of time. Only after he had defected to Octavian in 32 B.C. (just before Marc Antony’s defeat at Actium in 31 B.C. ), he was equipped with enough prestige and power in Rome to resume the rebuilding of the temple and complete it. 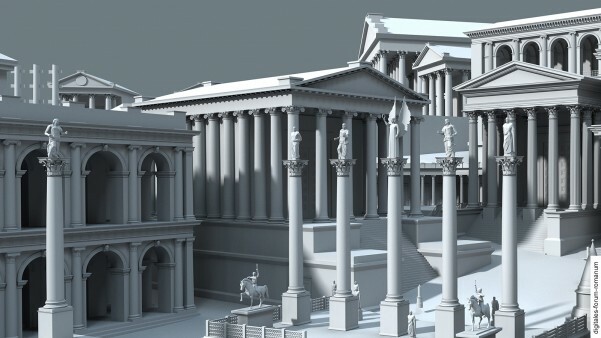 However, it seems like he was unable to exploit the temple for his own self-representation; instead the building was used in service of the self-representation of the victor and new ruler Augustus. This fact is alluded to by the literary sources that report that tritons with shell horns adorned the temple as acroteria – this was a common motif within Augustan imagery used to refer to the naval victory of Actium. 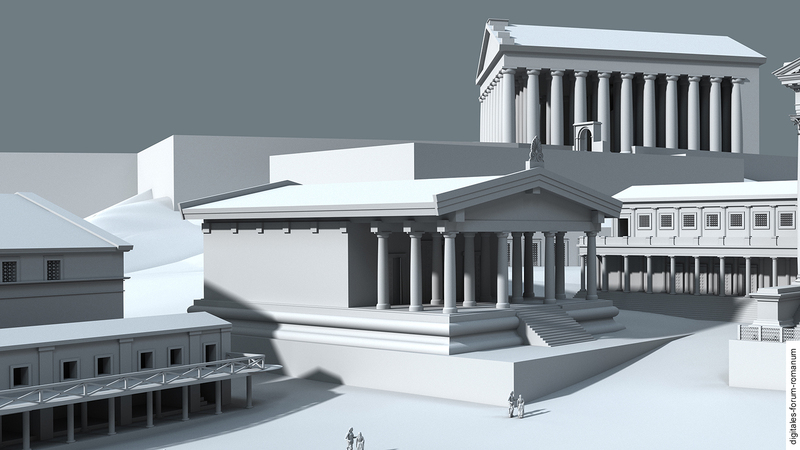 The newly built temple of Munatius Plancus stood in stark contrast to the emphatically archaic appearance of its predecessor. 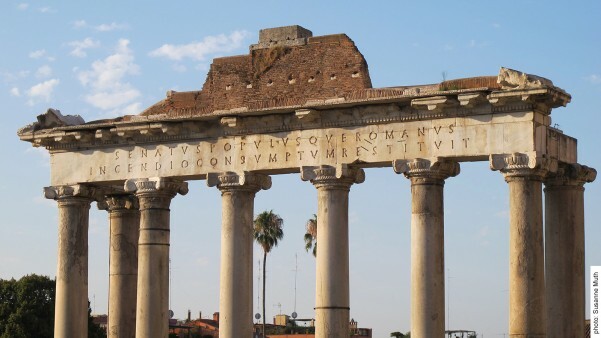 The inscription on the architrave informs us that the temple was damaged by a fire in Late Antiquity and therefore had to be restored: SENATVS POPVLUSQVE ROMANVS / INCENDIO CONSVMPTVM (= the Roman Senate and people restored the temple that was damaged by a fire). It is difficult to determine the exact date of this event, because apart from the inscription no literary sources mention it. 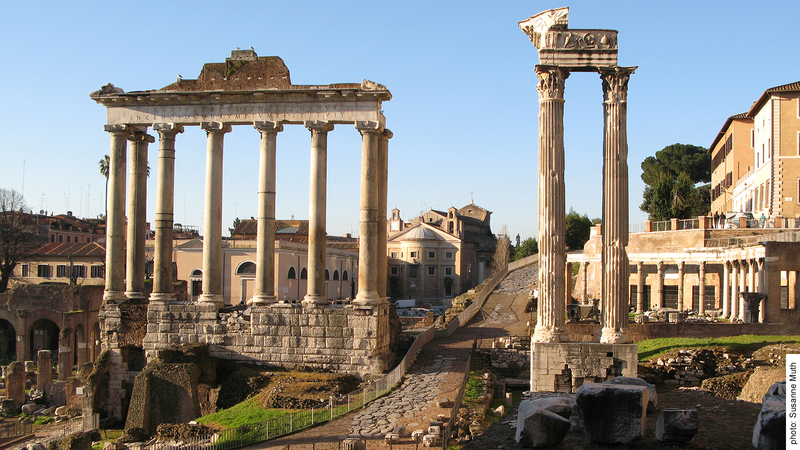 We can rule out the disastrous fire in 283 A.D., because the Temple of Saturn is not listed among the damaged buildings in the literary sources. Based on stylistic considerations, the temple’s column capitals, which clearly belong to the restored version of the Augustan building in Late Antiquity, can be dated to the second half of the 4th century A.D. The fire damage therefore most likely occurred in the 4th century A.D. What is unusual about the related restoration inscription is that it does not name Saturn as the head of the cult and only refers to the Senate and the people as the financial benefactors, without naming the Emperor or the city prefects, whose responsibility it was to carry out such restoration procedures (for the individual phases, see below). First and foremost the temple served as a cult site for Saturn, who was equated with the Greek god Kronos. Saturn was the god of agriculture and wealth; descriptions of his cult image inform us that he held a scythe and that his head was concealed. The feet of the cult image were bound with woollen cords, which were untied at the most important cultic celebration for Saturn, the Saturnalia. 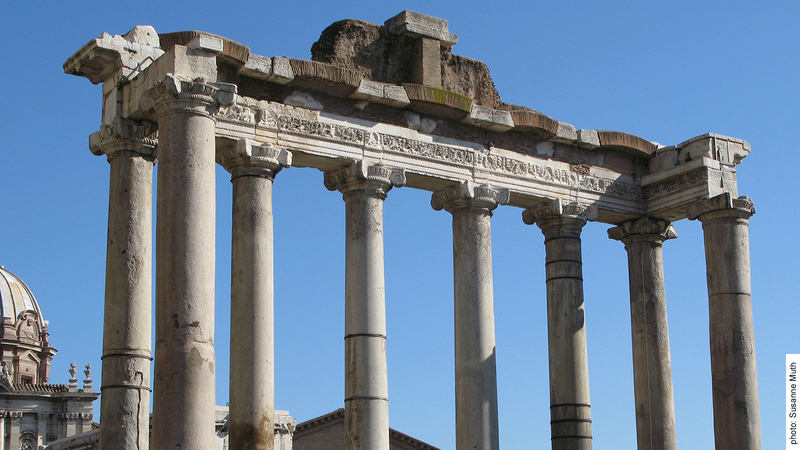 The Saturnalia were celebrated in December on the day that the Temple of Saturn had been dedicated. 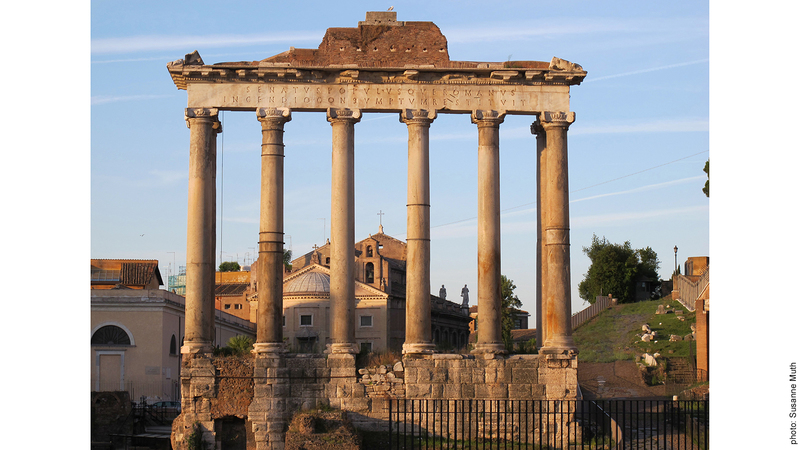 In addition to its value as a cult site, the Temple of Saturn was also used by the Roman state (res publica) for administrative purposes. Especially important was its role as the Aerarium, i.e. the building in which the state treasury was located. According to the literary sources, the temple served this purpose ever since its first construction – this makes sense, because the first state treasury of the early Republic was created by transferring the property of the exiled kings to the people of Rome; consequently the treasury had to be situated near the new political centre at the Comitium, under whose control it then stood. In later time periods the Aerarium within the Temple of Saturn also served as an archive in which the laws and resolutions of the Senate as well as the register of births and legates were kept. 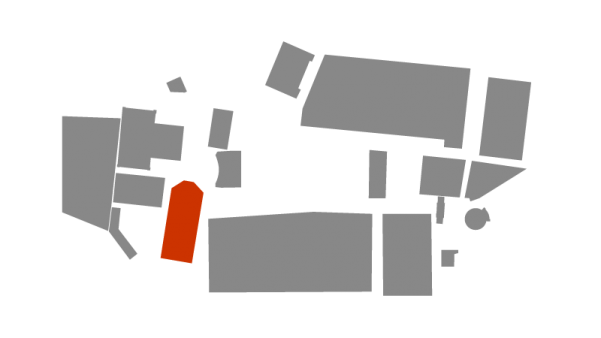 It is unclear where within the temple the Aerarium was exactly located. On the one hand, it is assumed that the Aerarium was situated beneath the steps of the temple’s substructure, because there are remains of a door on the east side of the podium wall. However, the available space seems much too small to house a treasury and an archive. Thus, the location of the Aerarium can more likely be identified as the cella of the temple: Furthermore, the sources tell us that Tiberius Gracchus had the cella of the temple sealed in order to deny his political opponents access to the treasury; In 49 B.C., after Caesar had marched in to Rome, he had the temple’s doors forced open to gain access to the treasury. The temple that is visible at the present-day excavation site rests on a high substructure which evens out the sloping terrain: The difference in height between the clivus Capitolinus (the road on the west side) and the vicus Iugarius (the road on the east side) is about 6 m. A compact core composed of opus caementicium and surrounded by ashlar travertine blocks acts as the actual substructure upon which the temple stood. What has survived from this temple are merely the front columns of the northern façade with the architrave resting on it (which also bears the restoration inscription) and the remnants of adjacent columns located on the temple’s long sides. All other parts of the upper architecture, such as the cella walls or the roof, have not survived. The same applies to the entire stairway leading up to the actual temple (for images of the present-day ruin, see below). Recent excavations of the podium of the Temple of Saturn have revealed the remains of the earliest form of the temple. These include the remnants of ashlar walls composed of cappellaccio tuff, similar to the walls of the early Republican (and therefore contemporaneous) Temple of the Dioscuri. 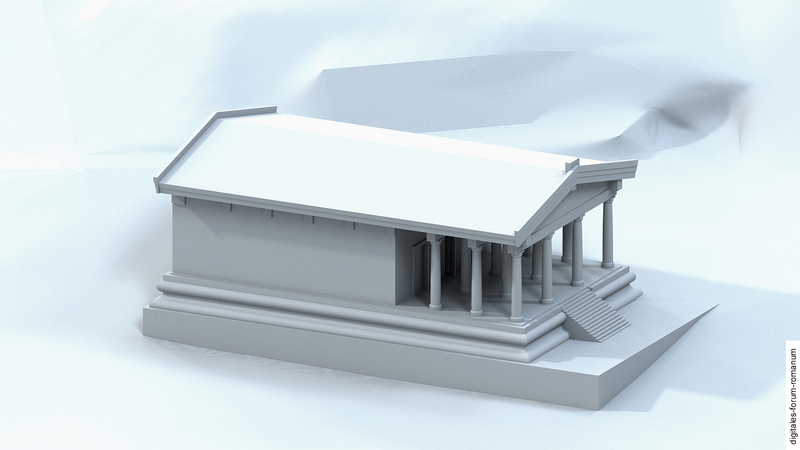 Because nothing of the upper architecture has survived, our reconstruction of the outer appearance of the temple is based on other contemporary temples (whose remains are in an overall better condition) in the so-called Etruscan style, e.g. on the Temple of Dioscuri on the Forum. 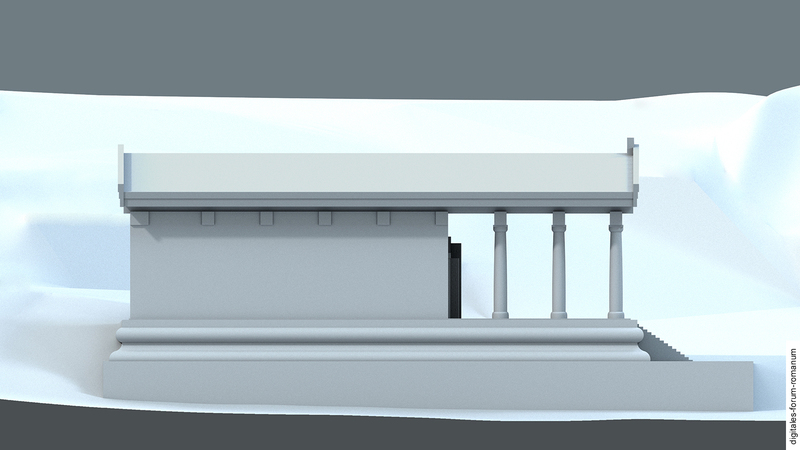 Accordingly, we have reconstructed the temple with a long front hall, supported by pillars, and an adjoining tripartite cella. 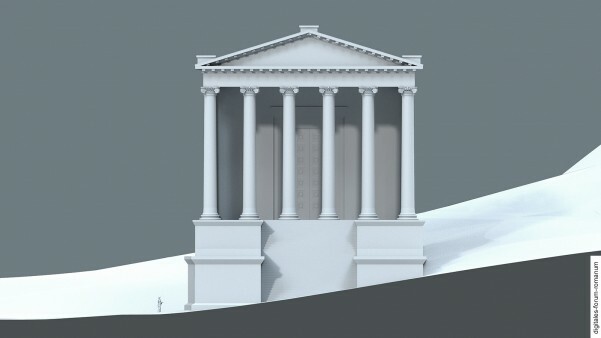 Reconstructing the steps leading up to the actual temple is a problematic undertaking: Because the early Temple of Saturn already stood on a strongly sloping terrain, it is plausible to postulate a terraced substructure which evened out the differences in height and formed the base on which the actual temple with its podium stood. Accordingly, we have reconstructed the complex of the early temple with a substructure within our model. For the terrace of the temple we suggest an access point on the west side, because it would have been the easiest solution to situate the entrance to the temple terrace along the Clivus Capitolinus. Because there are no surviving temples that have been dated to this period and possess a lengthy set of frontal steps, we have ruled out a reconstruction in which the temple is accessed from the north side via such a set of steps – this is a feature that first came into play in subsequent phases. The rebuilding of the temple, which was initiated by Munatius Plancus in the early Augustan period, led to a considerable modernisation of the building: Whereas the temple had retained its archaic appearance until the middle of the 1st century B.C. and was therefore conspicuously distinguishable by its quat and simple architecture from the magnificent late Republican temples on the Forum (Temple of Concord, Temple of the Dioscuri), the Temple of Saturn was re-erected in the popular Roman-Hellenistic style. Little has survived of the upper architecture. 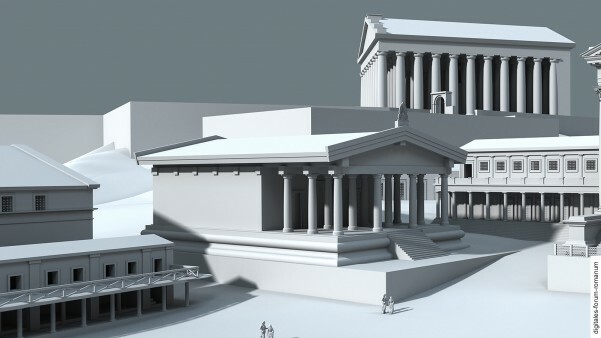 However, the temple from Late Antiquity most likely had a very similar appearance to the Augustan building; we can therefore base the reconstruction of the former on the latter. 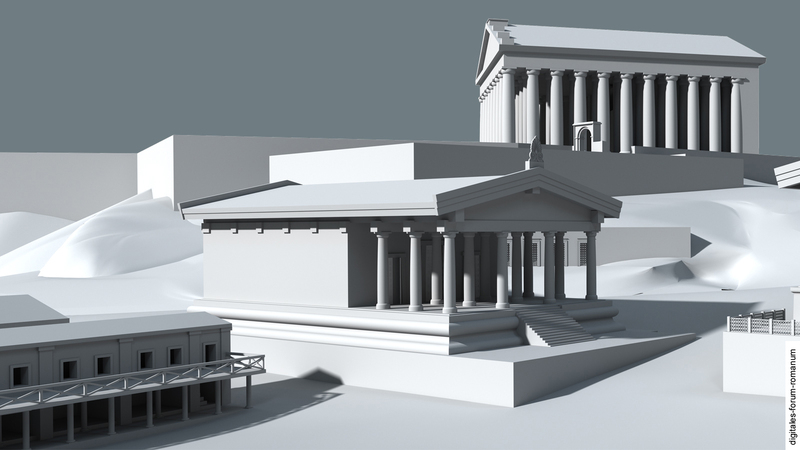 Following this, we can reconstruct a prostyle temple with six towering Ionic columns at the front and half-columns in front of the side walls of the cella. 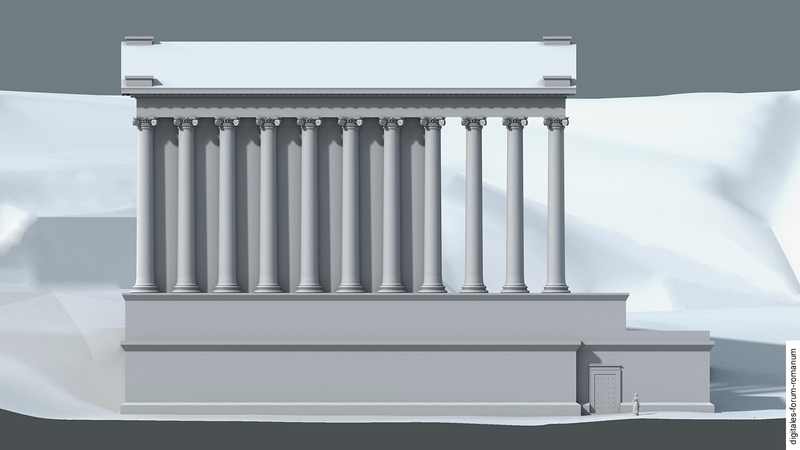 Some of the structural elements of the Augustan temple were probably reused and built into the temple from Late Antiquity, for example the entablature and four of the column bases, which can be ascribed to the Augustan period due to stylistic criteria. The podium (composed of travertine blocks) of the Augustan temple was reused in the restoration of the temple, which had been destroyed by a fire. Its façade, with six columns at the front and one column at each of the sides, originated from structural alterations made to the temple in Late Antiquity. 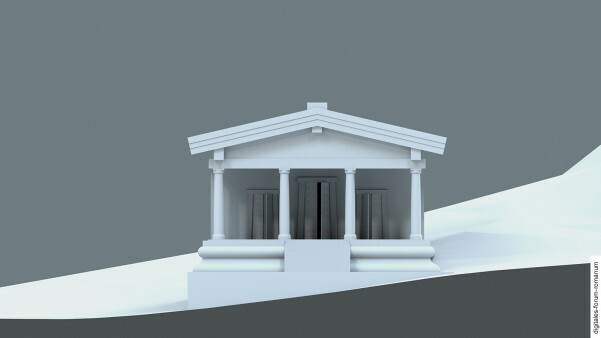 While the Ionian capitals can be dated to the phase of this newly constructed temple based on stylistic aspects, other structural elements were composed of spolia (i.e. elements which belonged to older buildings and were being reused): This holds true for the column shafts made of granite as well as the column bases and the blocks of the frieze, which originally belonged to other buildings (for example to the Augustan Temple of Saturn). The outer appearance of the temple from Late Antiquity seems to have been based on its Augustan predecessor. F. Coarelli, Saturnus, aedes, in: E.M. Steinby (ed. ), Lexicon Topographicum Urbis Romae IV (Rome 1999) 234-236. E. Gjerstad, The Temple of Saturn in Rome. Its Date of Dedication and the Early History of the Sanctuary, in: M. Renard (ed. ), Hommages à Albert Grenier (Brüssel 1962) 757-762. I. Köb, Rom. Eine Stadtzentrum im Wandel (Hamburg 2000) 70-83. G. Maetzke, La struttura stratigrafica dell’area nord-occidentale del Foro Romano come appare dai recenti interventi di scavo, Archeologia Medievale 18, 1991, 43-200. P. Pensabene, Il Tempio di Saturno. Architetture e Decorazione (Rome 1984). L. Richardson Jr., The Approach to the Temple of Saturn in Rome, American Journal of Archaeology 84, 1980, 51-62. B. Steinmann, R. Nawracala, M. Boss, Im Zentrum der Macht. Das Forum Romanum im Modell (Erlangen-Nürnberg 2011) 44-47.